← Character Design Contest One Hundred! chrisglen: Unfortunately for Highfather, he hasn’t seen Super Size Me. Can Morgan Spurlock save him in time? 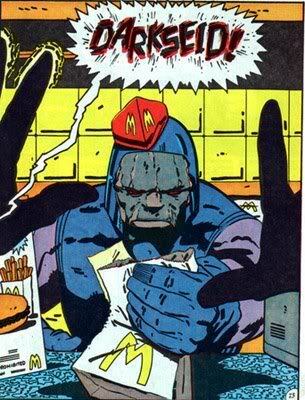 Daniel: Darkseid’s latest ploy to hide the Anti-Life Equation in Happy Meal puzzles didn’t go according to plan. Herr D: Complaints mysteriously stopped at one location. BenK22: You’re going to get it his way. Calvary_Red: I hope you appreciate, Kal-El, that everything that happens from this point is on your hand. The grills will rain fire, the grease will boil, the streets will run red with the ketchup of billions served. My overall top line, however, has to be from JWMan, "This week on Undercover Boss ..." I do like that show, and I think Darkseid going undercover at the Apokolips McDonald's is hilarious. 4 Responses to Caption Challenge 129 Results! Congrats JWMan, and thanks for the nod, Jeff. I agree with your choice (I know, you were waiting for my approval). Most amused me, some confused me, but that one made me choke on my tea a little. Congrats, JWMan! Now I know why I had to spend my high school Friday nights working while every else went to the football game.